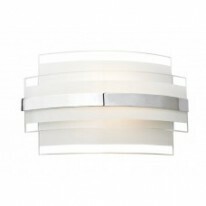 If your wall looks bare and needs a hint of class, a wall light could be the perfect solution! But, on top of that a LED wall light will trump any regular wall light. They will provide a more brighter tone, supplying your wall with a dazzle of pure white, won't damage your paint work or wallpaper and will save you a lot of money in the long run. The LED wall lights stocked with Lumination all have a 3 year solid guarantee! The LED wall lights also have a low wattage but that doesn't mean poor quality. If in stock we can ship out with one day delivery the same day!